The social media melee is a busy world and one that can be tough to manage, even if it’s your full-time job. You need help. Or at least tools. Lots and lots of tools. 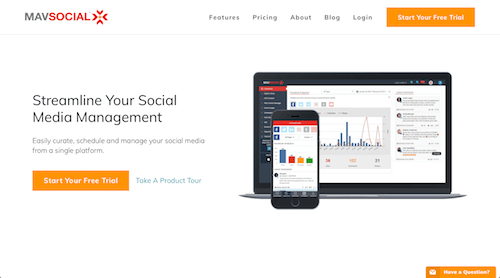 We’ve already served up a full list of the best social media management tools. So, what’s up with this list? Well, many of the tools on our first list are premium tools: you have to pay to play. What happens when you’re just getting your toes wet? What happens if you don’t have the monthly budget – or aren’t convinced these tools are deserving of your monthly budget? 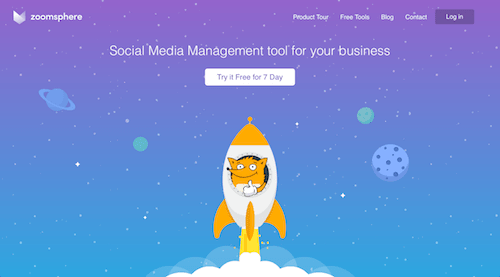 You look to the best free social media management tools, that’s what. They may be free, but these tools are robust. They work wonders. They’re well reviewed. And yes, they’re really free. While many of the tools below offer both free and premium options – everyone has to make a living, right? – we’ve only chosen those that offer hearty, many-featured free versions that actually perform a useful function, instead of just teasing you to purchase the full/premium version. So, go forth and be even more social. For free. 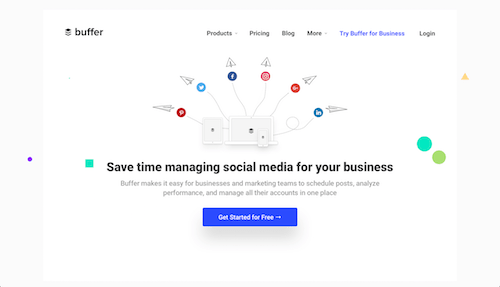 Buffer is a big name is social media scheduling and management. Not only does it enable management of Twitter, Facebook, LinkedIn, Google+, and Instagram, it also allows you to schedule posts outside the platform, via handy Chrome extensions. That said, our favorite feature may just be Buffer’s suggestions on the perfect time to schedule your posts, based on your followers’ average activity and engagement metrics. 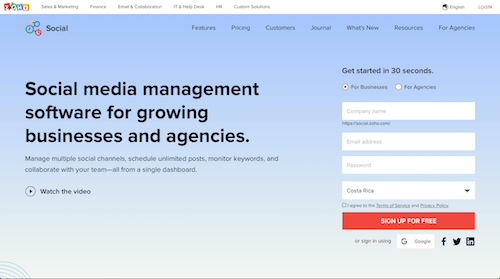 A big name in social media management, CoSchedule is not just a tool to schedule posts and manage your social efforts; it’s also built for team collaboration, social analytics, email marketing, and other much-needed integrations with your social efforts. We love that it’ll also help identify optimal post times and re-publish your best-performing posts in the interim. 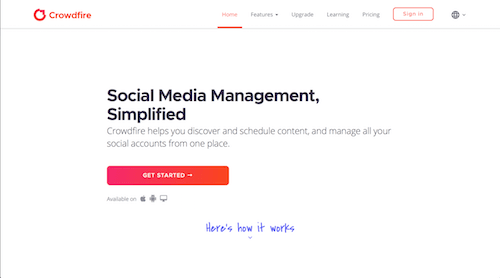 An established but constantly growing social media management platform, Crowdfire helps manage your social media accounts and post great content. But it does more than that, adding to the mix article suggestions, automatic posting for site updates, and other oh-wow-that’s-a-great-idea features that’ll pump up your social media accounts. 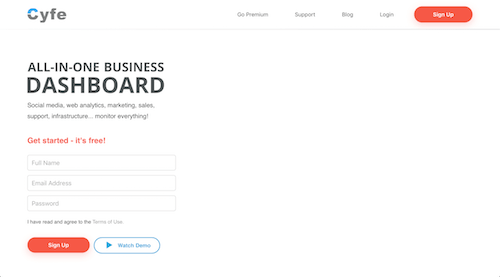 Cyfe is an all-in-one business dashboard and very robust tool that does more than social media management, but for the purposes of this article we’ll stick to that. Connect your accounts, and Cyfe will dish up plenty of insights into your social media, including brand mentions, Twitter followers (including, over time), Facebook engagement demographics, and more. If you’re active on Google+, then you need Friends+Me, a free social media management tool designed just for this platform. As its name implies, the idea behind the tool is to enable you (and a friend) to collaborate on your Google+ account, share content, and take your Google interactions to the next level. 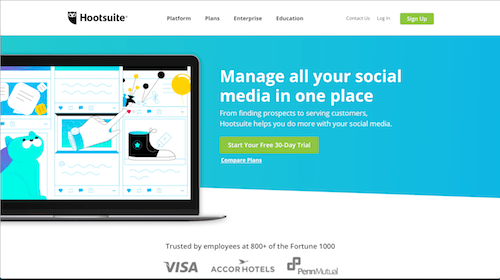 Hootsuite is one of the biggest names in the social media management biz, and for good reason: Offering both free and premium plans, this robust tool works with most major (and a few minor) social media platforms, enabling you to schedule posts, upload photo/video, follow mentions, and perform other important tasks. 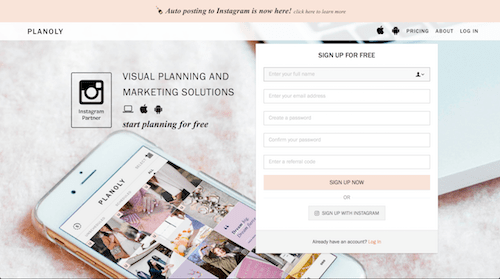 With a free-version focus on Instagram, Later is all about scheduling your social media posts so your account stays populated with beautiful photos. That said, the platform also works with other major profiles, including Facebook, Twitter, and Pinterest, and including a nifty visual content calendar, where you can drag-and-drop your most eye-catching photo for easy posting. A blend of maven and social, MavSocial teaches anyone to be a social media maven – a trusted expert in your industry or niche. We love the professional visuals and organization, which make it easy to track your social activity, and really appreciate MavSocial’s multi-lingual posting abilities, including onto the important side of the Great Firewall of China. 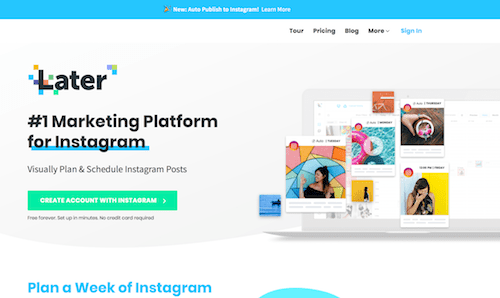 Planoly is an Instagram scheduler tool that keeps your accounts up and running, serving up great posts even while you sleep. 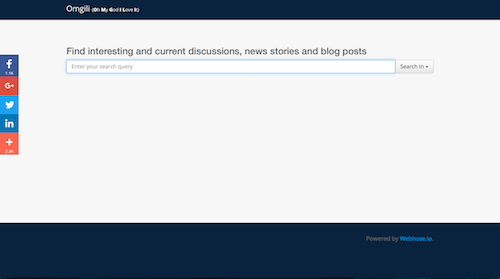 What’s more, the dashboard also makes it easy to discover new content, via username or hashtag search, and you can easily bulk-upload content, plan your calendar, and fire off posts, so you look as professional as you want to be. 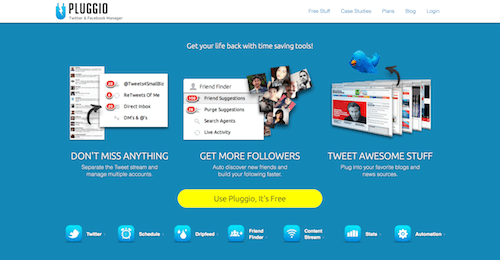 A unique Twitter and Facebook management tool – yes, just those two platforms – Pluggio is designed to help brands and marketers manage two of the biggest social media accounts in the world. 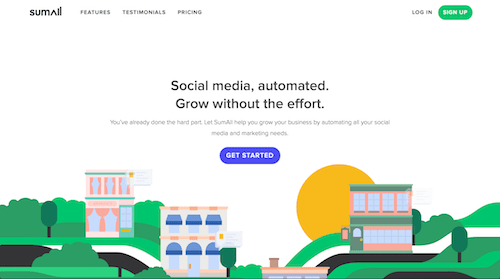 Included is a full set of automation tools, so you can schedule posts galore, automate content curation, among other set-‘em-and-forget-‘em features. Yes, yes, we’re tooting our own horn but it deserves to be tooted! 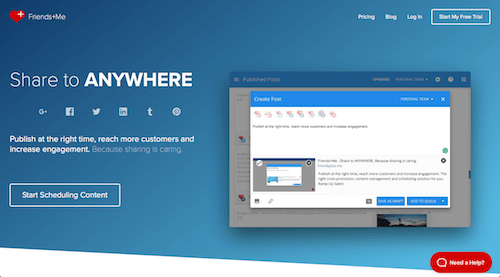 You can’t publish great content without making it shareable and ShareThis is the free social media tool for doing just that. You’ve seen us everywhere, even if you didn’t know what you were seeing: floating icons next to, above, or below a great article or blog post – one click, and you’ve pushed that share-worthy content to social, sent via email, or interacted in other ways. 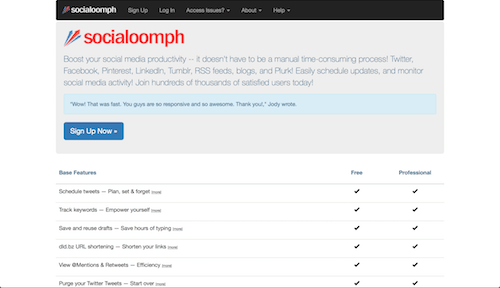 SocialOomph is a fully featured social media management tool, but the free version is Twitter-centric. That said, if you’re active on Twitter, then you’ll appreciate SocialOomph’s ability to track keywords, schedule tweets, and even auto-shorten your URLs. Be aware, though, that if you want to dig into all the tool’s features, including Facebook, Pinterest, and LinkedIn management, you’ll need to upgrade to the premium version. In social media, you’ll naturally have strengths and weaknesses. Enter SumAll, a cross-platform tool that schedules posts, monitors and assesses your performance on various channels, and then helps you understand the correlation between it all. And, since it’s totally free, you can link unlimited platforms, trigger unlimited automations, and receive unlimited data and metrics. Free for everyone. There is no paid version! Want to boost fan engagement? Want to save time? 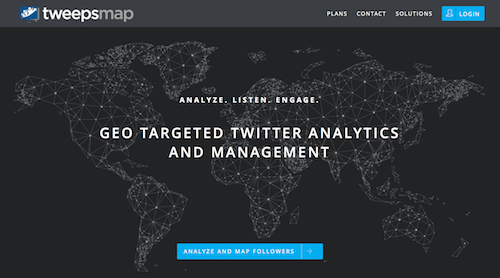 Then, you’re going to want to have a gander at Tweepsmap, an all-in-one Twitter platform that focuses on location to improve your engagement. Not only does the platform identify where your followers live, but it also targets tweets based on location and ensures you’re publishing relevant information to those followers. For active Twitter users – yes, we’re talking to you! 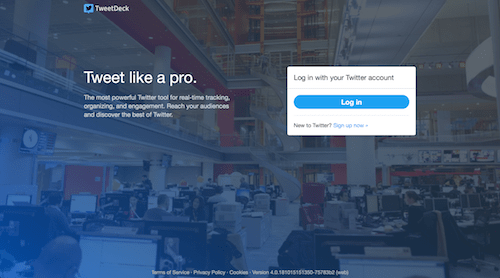 – it’s hard to beat the functionality of TweetDeck, which help take some of the [unwanted] noise out of Twitter. The idea is that, if you filter out some of the unnecessary conversation, you’ll have more time to build meaningful engagement with the followers you’ve so carefully cultivated. 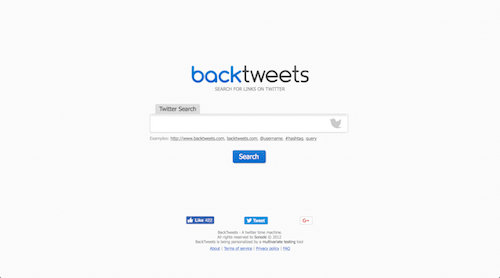 Another Twitter-centered tool, TweetReach is the perfect complement to other tools in the sphere. Let’s put it this way, if you want to know how far your tweets have reached, in addition to the impact and meaning of all your Twitter discussions, this is the tool for you. Bottom line: Choose TweetReach to have greater impact for lesser effort. Let’s get real: Not everything on social media has to be completely custom, with a real, live person behind the monitor. 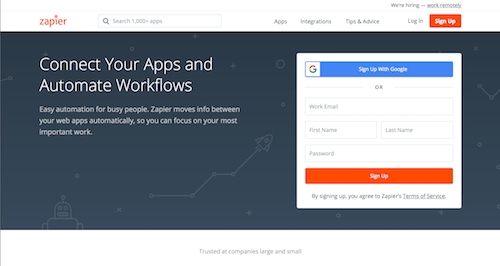 Zapier exists for all those autopilot moments, when you just need to publish your content, on a schedule and to the right platforms. We also love the social listening features, which allow you to track brand mentions and keywords. 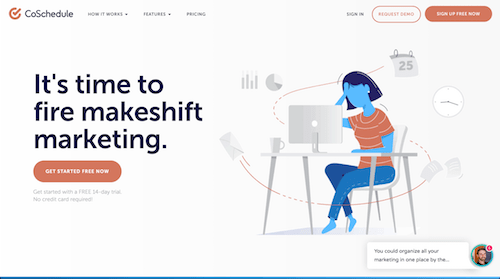 Full disclosure: Zoho Social is designed more for businesses and agencies, but solopreneurs, bloggers, and other small businesses will get good use out of the limited free option. Link multiple social profiles, schedule posts, and even research keywords relevant to your brand and offerings. Advanced reporting and Facebook Lead Ads integration are standout features. In the world of social, almost nothing beats a great video. 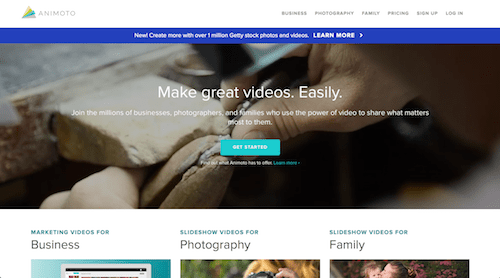 And that’s why we love Animoto, a tool that makes spectacular video simple. Not only is it extremely easy to load your video and add text overlays – hello, muted video autoplay! – but it also enables custom style and sound, photo clips integration, and even full photo slideshows. A picture speaks a thousand words, so Pixabay offers billions of words. 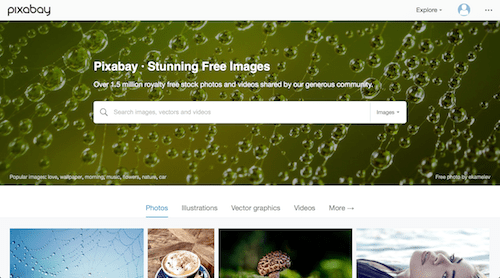 Specifically, more than 1.5 million totally free images, including photos, illustrations, vector graphics, and even video. Most of the images are really well composed and equally well tagged, thus serving up dozens, if not hundreds of relevant results for most searches. You know that video is one of the most dominant (and still, fastest-growing) marketing tools in 2018, but do you really understand how to best market through video? 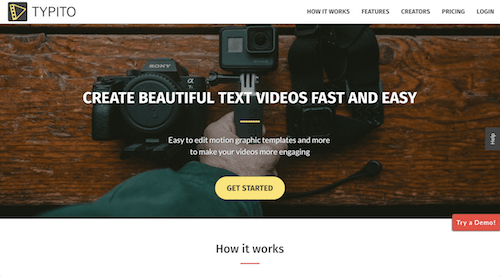 Enter Typito, an easy-to-use app designed to combine your best video with beautiful photography and eye-catching typography. The result: Great video for all your social media channels. When you don’t have a huge budget, sourcing photos can be a drag. 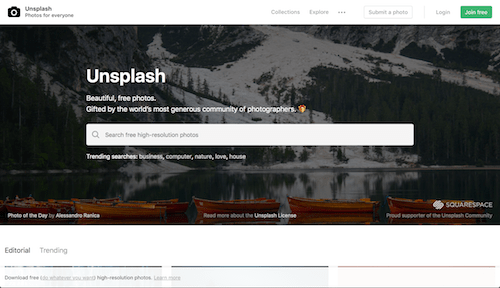 Enter Unsplash, a community of generous photographers who freely share beautiful images. The Unsplash license grans irrevocable but nonexclusive rights to use all images for free, both personally and commercially, with a suggestion of reciprocal credit. Think of it as well-deserved thanks. 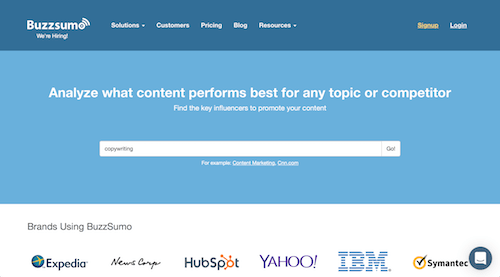 BuzzSumo exists at the crossroads of social media management and analytics, with a tool that not only helps you research great content ideas, but also analyzes your social engagement and post metrics. You’ll uncover a lot of really useful data, including the best times of day to post, how long your posts should be, and which types of content work best on each platform. 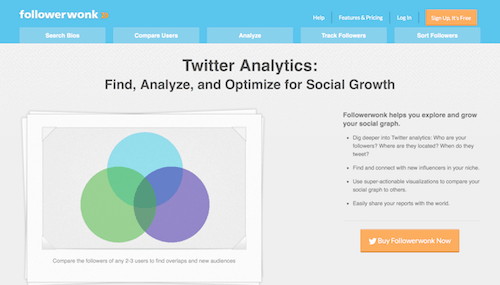 For many Twitter users, the free version of Followerwonk is an absolute must: a strong analytics tool that helps you know your Twitter audience, including when they’re most active throughout the day. (Post now, post now!) As a result, you’ll be able to schedule your posts for when they’re most likely to be read because, yes, Followerwonk will even integrate with Buffer, if you’d like. Are you surprised to see Google Analytics on this list? Don’t be. Because, no matter which social channels you use, an important question will always be, how effective are your social media efforts? 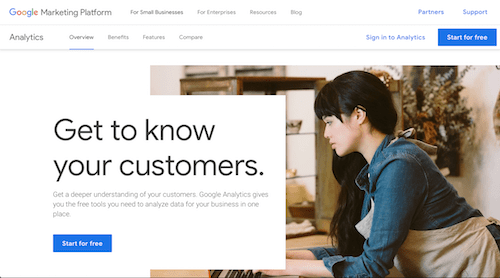 That’s where Google Analytics steps in, to track how much traffic you drive through social, what of your content is most engaging, and other important metrics to give insight into your social followers’ needs and interests. 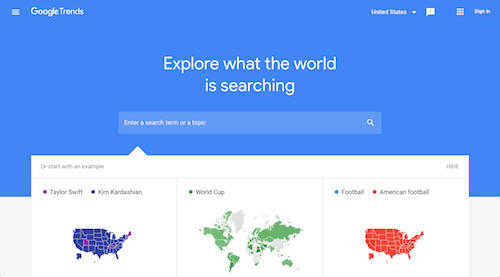 Another tool that you may not immediately think of as a social media tool, Google Trends helps you uncover what your followers want to know. What they’re searching for. What will grab their attention. And this free tool helps you discover it all, with search term comparison, website comparison, geographic patterns, traffic insights, and more. You know it’s important to analyze your social presence, but what about your competitors’? 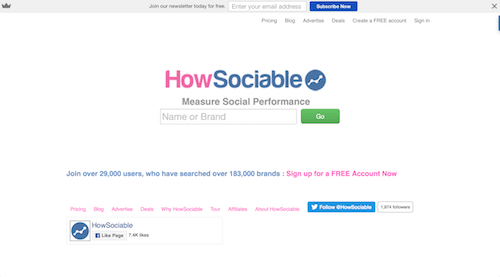 Enter HowSocial, a very handy tool that makes it as easy to assess your competitors’ social media success as it is your own. Not only does the tool help you identify your strengths, but it also aids in uncovering weaknesses and discovering where your competitors have you beat. With a sharp focus on Instagram, Iconosquare is the tool for digging deep into your Instagram story analytics, engagement, and basic photo/video analytics, so you can uncover spaces for improvement. The goal: Supercharge your performance and fuel influencer marketing, so you stand out on the already spectacularly standout landscape that is Instagram. If you still have [bad] high-school flashbacks, this might not be the tool for you. 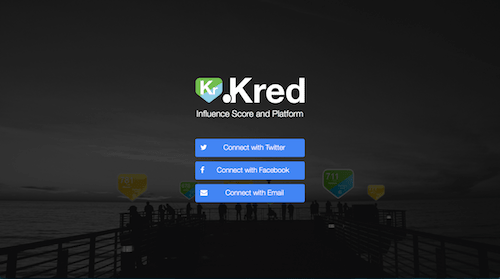 But, if you were the kind of kid who looked forward to Report Card Day, then you’ll love Kred’s social media-scoring tool, which helps measure your brand’s influence, engagement, and outreach. Basically, they’re grading you on your influence. Buckle up! Organic Facebook reach can be a tough nut to crack, but Likealyzer makes it a little easier. 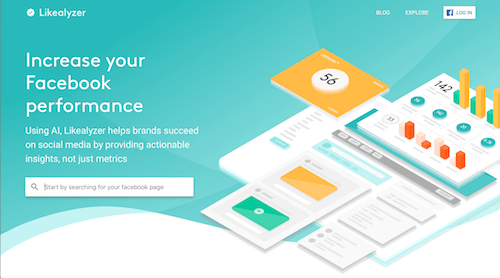 Serving up a fast – literally, just copy+paste your Facebook page link into Likealyzer – but comprehensive look at your Facebook presence, the tool offers one-click access to often eye-opening insights on your organic reach and Facebook performance. We know, we know – again, with the build-in analytics. But, sometimes they’re really great! Case in point: Pinterest Analytics, which uncover who’s pinning what, who’s viewing what, and who’s clicking through to where. It’s powerful stuff in the visual world of Pinterest. 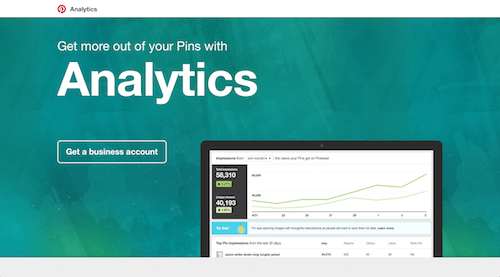 What’s more, Pinterest will also serve up insights into your analytic trends over time, so you get the full picture of how you’ve improved. 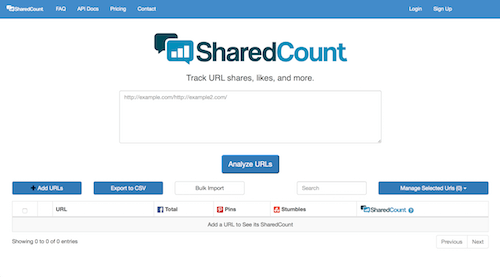 We love easy and we love fully featured, so of course we love SharedCount: Designed to track up to 10,000 daily queries into your shares, tweets, likes, and other social interactions, this free tool is as simple as it comes. Just copy+paste your website address into the search bar, and SharedCount will troll Twitter, Facebook, Google+, Pinterest, and other social sites. 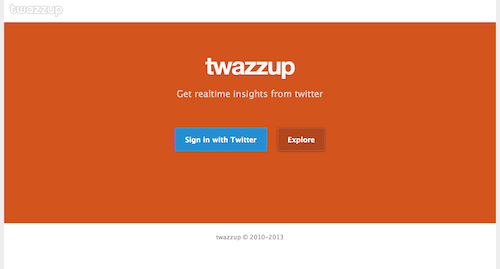 If Twitter’s your jam, then welcome to Twazzup. (Yes, we love the name.) 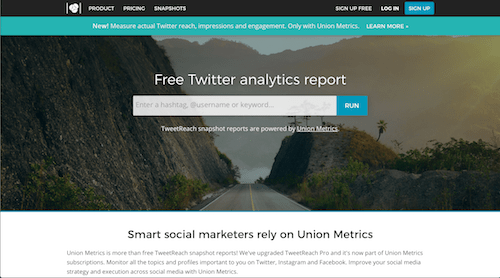 Ideally suited to newbies and solopreneurs, this tool tracks Twitter activity and serves up real-time updates. Go down the rabbit hole to discover the most active influencers related to your niche, the most retweeted photos and posts, and the most popular keywords related to any search. 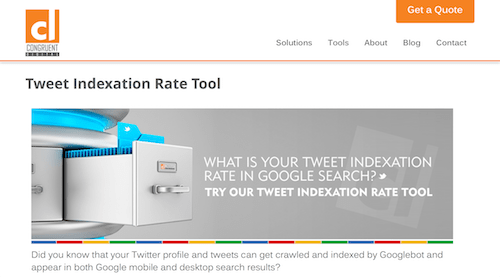 It’s a big phrase for a simple concept: the Tweet Indexation Rate tool quickly and succinctly uncovers how well your tweets are crawled and then indexed in Google – essentially, how SEO-friendly your tweets are. Think that’s not important? Well, ask the brands that receive hundreds or thousands of new followers from everyday Google searches. 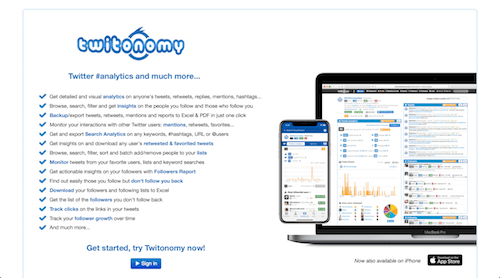 Another Twitter-only tool, Twitonomy serves up a wide range of free metrics (with even more in the premium version). Connect your account and you’ll soon have access to insights on your followers and followees, as well as your most popular tweets, best engagements, and most powerful interactions. 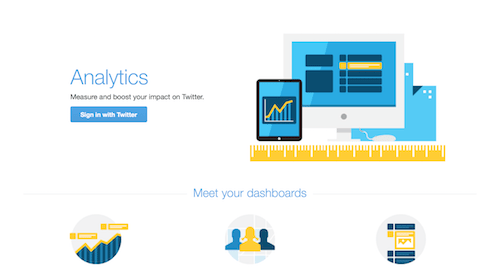 Don’t discount native analytics, including Twitter Analytics. It may be built-in but that doesn’t mean it’s not great; it’s still the #1 tool used to track Twitter stats, it’s totally and forever free, and it offers tons of widgets, buttons, and other third-party integrations to provide insight and additional functionality for your Twitter account. 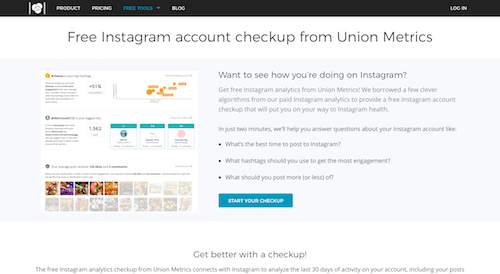 Run a free check-up on your Instagram account with Union Metrics, a free tool that provides insight into your Instagram health. Through analytics, the tool serves up information including the best time to post to your Instagram account, based on your engagement, as well as which hashtags will work best for your brand. Dun dun dunnnnnn… It’s every brand’s nightmare (no one likes to see their follower counts go down), but a reality of the social world. 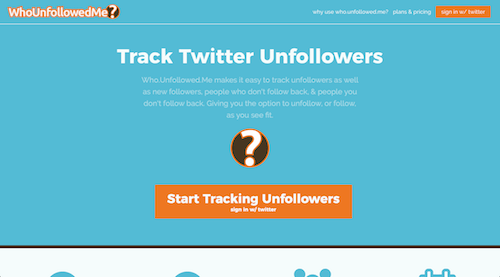 And that’s why you need WhoUnfollowedMe, a simple tool that tracks all your unfollows on your choice of schedule. We like that it also reveals who you follow but doesn’t follow you, and who follows you without your follow-back. ZoomSphere offers paid tools but, when you look hard enough, you can uncover some great free features, too. Among them are Facebook Reactions Analytics, which help you understand your fans’ emotions and engagement; the Facebook Reach Report, which analyzes your posts’ organic visibility; and the Agency Report, which dishes up a decent set of metrics for your Facebook account. 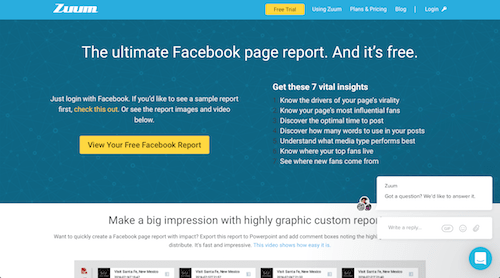 Built specifically for Facebook, Zuum Social is an excellent tool for brands that are very active on Facebook. Just login with Facebook and you’ll soon have access to very valuable page insights, including optimal post time and length, which of your media historically performs best, how new fans make their way to your page, and which of your fans are the most influential. If you’ve ever dreamed of owning a time machine, we’re going to make a tiny piece of your dream come true: BackTweets sifts through your Twitter tweet history, to build a tweet archive not just of your tweets but of all tweets. It’ll uncover all URLs, regardless of whether you used a URL shortener, and thus serves as an excellent listening tool. Who’s talking about you on Twitter? Who says the Big Social Sites are the only ones that matter? Certainly not forum users, who frequently chat, assess, recommend, and even complain on their favorite forums. 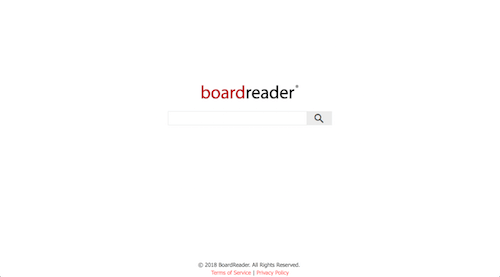 And that’s exactly where Boardreader steps in, running relevant searches, on both your brand and industry, throughout the world’s most popular (and sometimes, obscure) forums. There’s nothing worse than failing to respond quickly to a bad review. 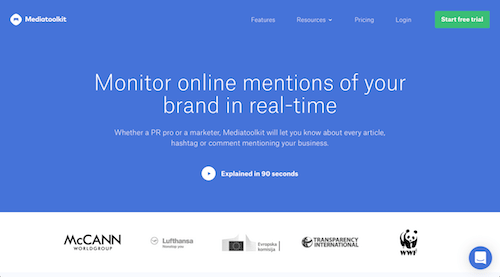 Enter Mediatoolkit, which sends real-time alerts for brand mentions across 100+ million online sources. It’ll dig up any mention on almost any social media site, website, blog or forum – and then alert you, immediately, so you can put out any possible fire. Reputation management is a big part of any brand, and that goes double on social media, where interactions are often 24/7 and immediate. 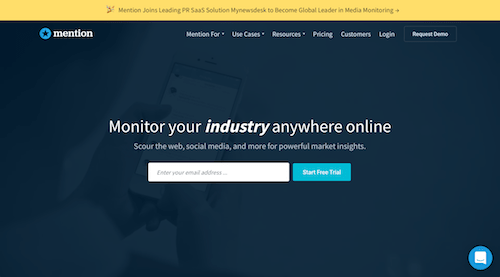 Enter Mention, a free tool that sources mentions throughout social media, forums, blogs, and other places, to track your brand online – and help you respond quickly, to either praise or criticism. For brands on Twitter, Mentionmapp is a great tool to uncover your most valuable interactions (and seek out new ones). 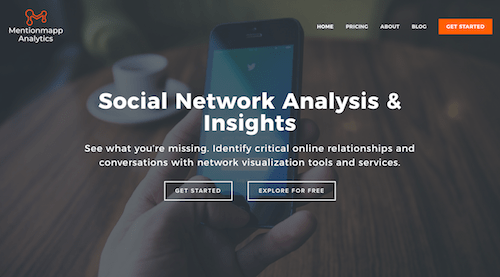 Essentially, the tool offers powerful visualization (= mapping) of your tweets, followers, and hashtags, in order to uncover your mentions, discussions, engagement, connections, and other important metrics. 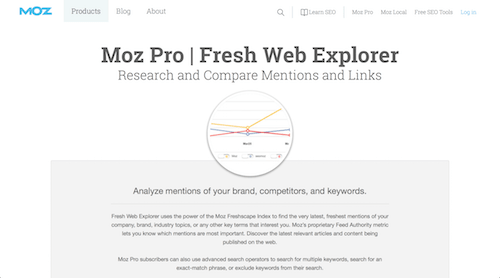 With an eye on your social reputation, Moz Fresh Web Explorer is an excellent tool for tracking your social mentions across the interwebs. Not only does it send real-time mention alerts, but it also enables keyword notifications, so you can easily quick-share content relative to your brand and audience. Sort through all the noise and dig up what’s relevant to you. An acronym for Oh My God, I Love It, Omgili is a tool with a sense of humor. And we love that. What we also love? Omgili’s ability to suss out the most interesting discussions currently happening online – message boards, blogs, social, and more – so you can hop right into the fray. And who doesn’t want to hop into the hot-right-now fray? Uncovering a full menu of Instagram analytics, SocialGimp is a great choice for visual brands that have a strong Instagram presence. 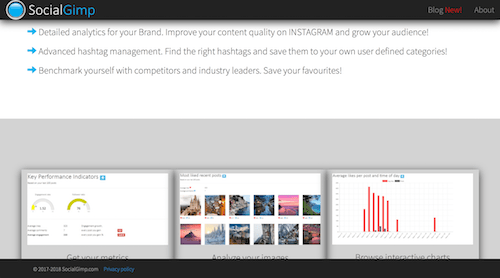 The tool provides easy and better insights about your Instagram audience – for example, which hashtags yield the most engagement – and also serve up important benchmarks to rate your successes versus your competitors’. 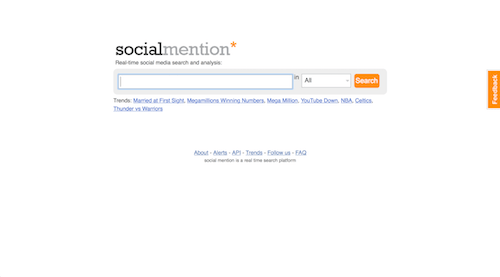 We love straightforward but that’s just one of the reasons we love Social Mention, a super simple search engine for hunting down your brand mentions online. Not only will the tool tell you how often you’re mentioned, but it’ll serve up stats like sentiment (positive or negative? ), who mentions you most often, the most common keywords associated with your mentions, and more. 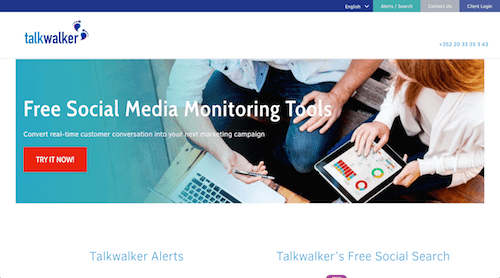 Talkwalker has some pretty robust paid tools, so you may not know there’s a powerful free version, too: social media trackers. Talkwalker’s social search monitors each and every online conversation about your brand, while Talkwalker alerts bills itself as the only free search to trace your digital footprint – every communication you’ve ever had on the Internet.